E.A. 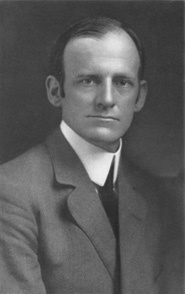 Diddle came to WKU in 1922 as athletic director. 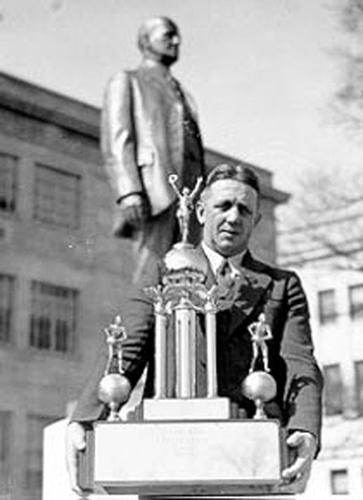 He coached the football team through 1929 and the baseball team until 1957. But as most people know, he came to fame waving a red towel while coaching the Hilltopper basketball team to a 759-302 career record. A collection of records regarding Diddle has been created from a variety of sources including the Diddle family. These records, housed in University Archives, include early athletic department correspondence, photographs, scrapbooks and interviews. The finding aid for this collection is now available at http://digitalcommons.wku.edu/dlsc_ua_fin_aid/7/. Images are available at KenCat. Allied collections are also described in KenCat. Jimmy Sacca, Billy Vaughn, Don McGuire and Seymour Spiegelman were students at Western Kentucky State College (now WKU). 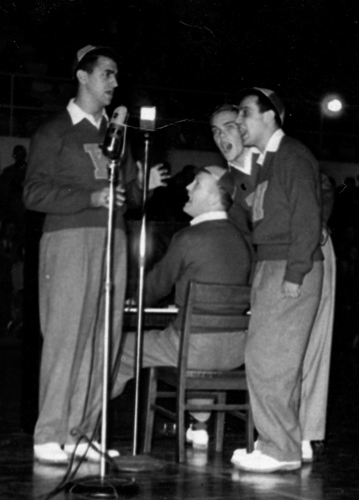 In 1952 they hit the big time as the Hilltoppers quartet with their song “Trying.” The group had several more hits including “P.S. I Love You” and performed together through 1963. Billy Vaughn went on to have a successful musical career with his orchestra. The group was honored at WKU’s homecoming in 1972. Check out the University Archives website: http://www.wku.edu/library/archive/ex1.php for more information regarding the group. Carlton Jackson came to the WKU History department in 1960 where he served with distinction through 2001. He is the author of nearly 20 books and innumerable articles which earned him the title Distinguished Professor of History. If you have Hilltopper records, photographs or memorabilia that don’t appear in the finding aids, please contact the University Archives at 270-745-4793 or via email at archives@wku.edu.